It's quite hard for me to sit here at this computer when the weather outside is picture perfect! We are having the most amazing weather over here on the east coast this entire weekend. I am taking turns visiting all my garden centers just so that I can throw money at them. 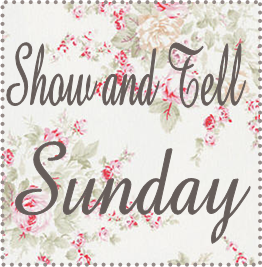 But I digress, the subject of today's post is Show & Tell Sunday and today over at Analise's blog you will find a list of links to other bloggers who are displaying and sharing their crystal, china and silver for you to enjoy. I have been a bad blogger lately, the pull of the outdoors is just too strong. When I pulled up google reader this morning there 400+ posts for me to read! Maybe I can do some blogging tonight when the sun goes down. SO, I ran around this morning snapping some pictures to share. I don't have much in the way of china, but one of my favorite things to collect is silver. Old tarnished silverplate especially. 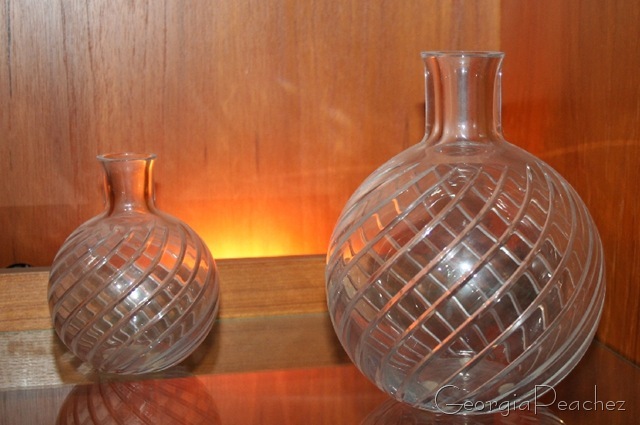 This pair of Baccarat vases were a wedding gift from my husbands grandmother. I hope they aren't as dusty as they look in the picture! Oops! I love little silver picture frames. 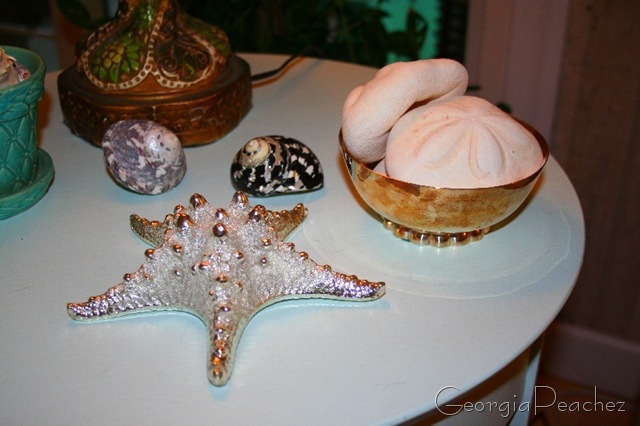 I love seashells too and I love to put them old silver bowls and things. 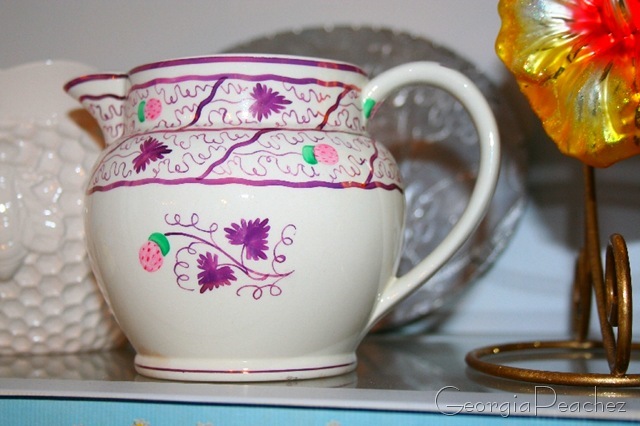 I don't have beautiful china to eat from, just Fiesta but I have a few pretty pieces here and there. Got to run back outside and enjoy this beautiful day, ciao! I’m staying in the home today, cause it’s raining all day long! I love silver too, like your pieces! Your china is lovely too! I love tarnished silver too! You have a lovely collection. Have fun in your pretty weather! 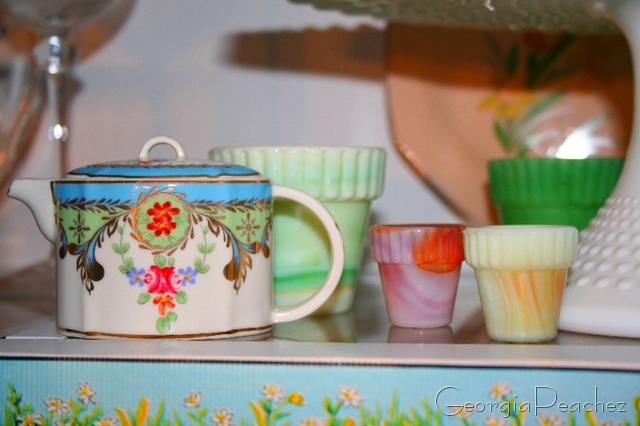 I love those little Akro Agate pots – so swirly pretty! Your collection of silver pieces is just wonderful! I’m coming late to the Show & Tell because it was so beautiful here in TX that I just HAD to get out in the sunshine myself!! That bright little purple and pink picture is eye-catching. I haven’t seen one like that before. Also, congrats on your feature on InspireCo… so awesome for you!! Hope you sell all of your pretties! 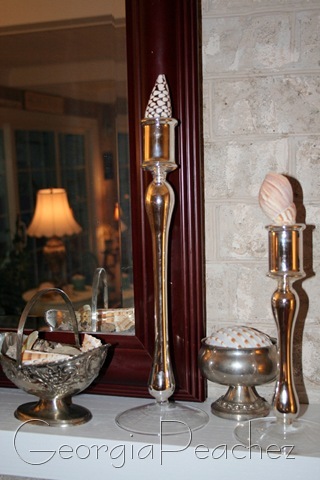 Love the shells and silver! Being married to a sailor, we are always collecting shells near a beach. Thanks for the wonderful inspiration and ideas for some of my pieces! 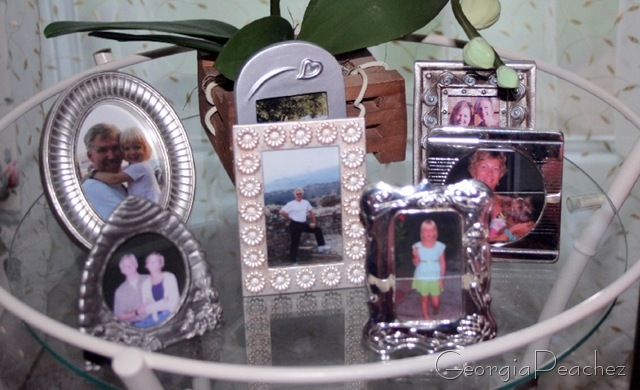 Nice picture frames and beautiful silver. It is raining in Holland so I take some time to look at all the blogs. 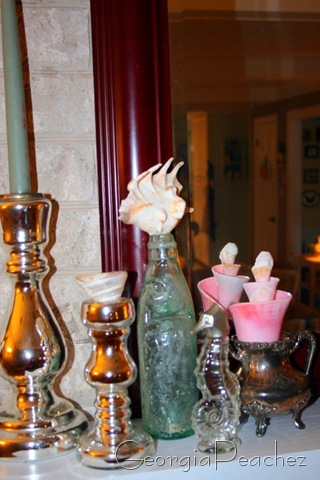 I especially love that little teapot. I know what you mean about the weather. This is the stuff I live for!